Musings from the Crow's Nest: Chickening out in Rio? If you have ever flown to Santos Dumont airport in Rio de Janeiro, you will understand why I refer to it as a chicken run. The plane swoops across the blue waters of Guanabara Bay and the runway appears below the wheels at the very last moment followed by a shuddering reverse thrust and screech of brakes as the other end of the runway – and more blue water – loom ahead. It’s not really as bad as it looks; it used to be incredibly short but, thanks to health and safety, bits keep getting added on. Most of the thousands of delegates to last week's Rio + 20 Conference arrived at the larger Galeão International Airport some miles away and were saved from the usual traffic chaos by the well organised event managers. Perhaps an arrival at Santos Dumont would have been more appropriate as the press had presented the event itself as quite a chicken run: a breathtakingly short period of negotiations that could save the planet from destruction. Of course, the reality was nothing like that; most of the final text had been negotiated long in advance, expectations were low, no big countries pulled major initiatives out of the bag and the outcome was somewhat predictable. Reporters, NGOs and many independent observers were dismissive and labelled the event as the failure of a ‘once in a generation opportunity for action’. The pre-conference hype soon fizzled. Worse still, there is likely to be an increasing public antipathy towards international processes and even less trust in public officials; and no Plan B available to address real environmental challenges. But amongst the gloom and weasel words, was anything of value achieved? I will take a harder look at the final agreements on oceans and seas. Before beginning, I have to declare an interest. I was one of the team preparing the Seas and Oceans text for the original Rio Conference twenty years ago; the biggest gathering of heads of state in the 20th century. I know how these processes work from the inside! 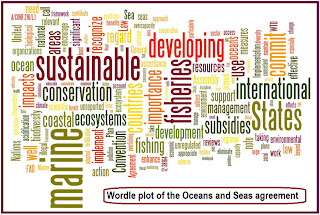 The Rio + 20 outcome agreement can be found here and the Oceans and Seas occupy paragraphs 158 to 177. 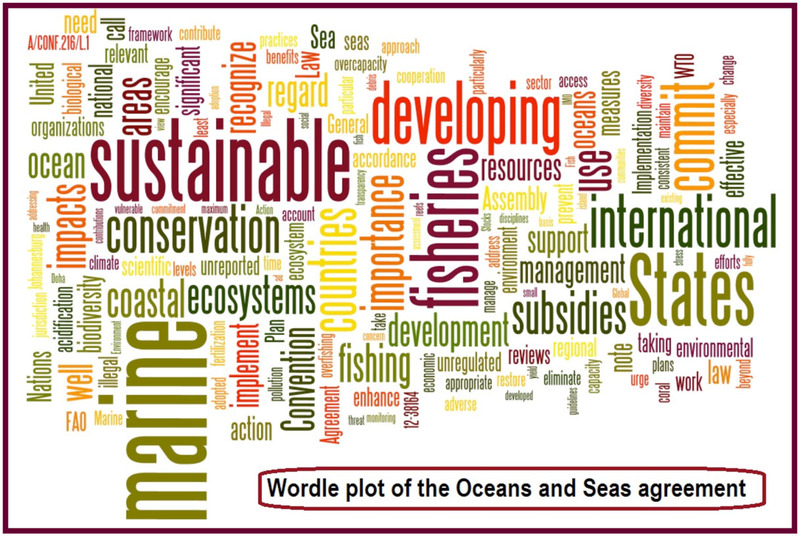 The Wordle plot I made (see image) really gives the overall big picture. The first seven paragraphs mostly reiterate previous obligations including the ‘Regular Process for Global Reporting and Assessment of the State of the Marine Environment, including Socioeconomic Aspects’ which is obliged to produce its first report by 2014. This is a useful process but it will take a lot of effort to prevent it from becoming a ‘lowest common denominator’ report rather than a challenging and forward looking one. Significant however, is the commitment to develop an international instrument under the UN Convention on the Law of the Sea for the conservation and sustainable use of marine biological diversity in areas beyond national jurisdiction (ie outside the 200 mile zone). The real battleground here will be on bioprospecting and rights over genetic material as well as the potential impacts of deep sea mining. There is also a commitment to take action on plastics in the sea and the importance of this was highlighted by a major international expert poll concluded days before the event that signalled it as the number one oceans issue. The agenda for action is painfully slow however; the wording is “We further commit to take action to, by 2025, based on collected scientific data, achieve significant reductions in marine debris to prevent harm to the coastal and marine environment.” More weasel words than commitment! This could be regarded as kicking the can down the street … and there was a lot of that in Rio. The next three paragraphs are worth looking at in more detail. Paragraph 165 asks for “enhanced efforts” on sea level rise, an issue that keeps getting brushed under the carpet. Still no firm commitments though. Paragraph 166 is an extensive call for support for initiatives to understand and prevent ocean acidification. Richard Black from the BBC has already pointed out the irony of the wording; at this stage “the need to work collectively to prevent further ocean acidification” is pretty meaningless, given that this will only happen if we stop emissions of CO2 from rising … and nobody agreed to that. Well, at least acidification is on the agenda. So too is the thorny issue of concern about potential environmental impacts of ocean fertilisation. The real concern is not over the little experiments done by scientists but the companies following behind that already purport to offer a ‘quick fix’ to global warming by pumping iron into the sea. It is nice to see the precautionary approach being evoked in this context (well, we did get some things right in 1992). Eight of the remaining ten paragraphs address fisheries. I have to share an anecdote about the original Rio conference, officially titled the UN Conference on Environment and Development (UNCED). A group of us, all ‘specialist officials’, prepared text that subsequently went to the Member State representatives at ‘Prep Coms’ … and usually came back in shreds. We wrote some carefully worded but bold stuff on the need for more concerted regulation of fisheries, given that most stocks would soon (in 1992) be exploited beyond sustainable limits. ‘If this is a conference about development and there is nothing to develop, fisheries should be removed from the document’ we were told. We wrangled a watered down version back into the text eventually but this gives you some insight as to what negotiators are up against. Don’t shoot the messengers. Back to the present. There is a strong commitment to meet the 2002 Johannesburg target to achieve Maximum Sustainable Yield (MSY) by 2015. This is a very strong statement that reflects the need for stock restoration, science-based management plans, ecosystem protection, reducing effort where needed and managing discards. Great stuff, but can it be achieved, given the target in the EU’s Marine Strategy Framework Directive to achieve MSY by 2020 and that lack of effective governance frameworks in many regions of the world? The next two paragraphs, on responsible fishing and IUU fishing (Illegal, Unreported and Unregulated) get closer to the heart of the problem; existing agreements aren’t being implemented properly and governance systems are too weak to do more than merely recommend. This problem is addressed to some extent by the measures in the subsequent two paragraphs. Firstly, the 2009 FAO Agreement on Port State Measures should keep tabs on vessel movements and the source of their catch. Some 14 countries had ratified it or were close to doing so by February this year but it will require 11 more to enter into force. International legal agreements move very very slowly but this one is worth pursuing. Secondly, there is a clearly expressed need to improve the transparency and accountability of regional fisheries management organisations, some of which have been, at best, passive observers of the pillage of their ecosystems. Performance reviews are being implemented but nobody really has the power to insist that the recommendations in the reviews are adopted. There is a general consensus amongst fisheries scientists that harmful subsidies are helping to drive overcapacity and the unsustainable exploitation of stocks. Paragraph 173, addressing this issue is the longest in the oceans section and gives me the mental image of a cat crossing a muddy bog. It refers back to the World Trade Association Doha Development Agenda, badly stalled since 2002 and the need to treat developed, developing and least developed countries differently and transparently. This is hugely contentious and may take years to resolve … but don’t tell the fish. Two further paragraphs deal with the complex issue of equity and equal opportunities for least developed and small island states and the access rights to fish stocks, markets and conservation measures by small scale fisherfolk. This is another minefield expressed with political correctness but with an unclear agenda. This doesn’t need weasel words, it needs a clear set of actions such as poverty reduction strategies, concessions by developed countries that are buying (or corruptly negotiating) third party access rights to the waters of developing countries, and help to develop fit for purpose local management schemes. Oh dear; I’m getting a headache and there are still two paragraphs to comment on! The first is a nicely written but toothless statement about coral reef and mangrove systems and the second is on marine protected areas. This is the sting in the tail; full reverse throttle from the 2002 Johannesburg Declaration where some observers claimed that the Oceans were the only beneficiaries from another failed process. Jo’burg set a target of 2012 for a globally coherent network of marine protected areas. Hello, wake up world, we’ve arrived! But no network. No problem, we’ve moved the date to 2020 so everyone should be happy now (and some can go back to sleep). Are you getting the feeling that I’m ever so slightly depressed about all of this? Fortunately it is mixed with a measure of anger because cynicism would tell me it’s time to quit and hide in a cave somewhere. As it happens, the oceans and seas fared ever so slightly better than other areas. The sad thing though is that we have not come to grips with the fact that our global governance mechanisms are woefully inadequate and unable to keep up with the pace of change, let alone to be proactive and take control of our future. That is the real and important lesson from Rio. It is shocking to think that the combined wit of six billion people can only come up with 19 paragraphs of caveated reaffirmations on our future seas with some words of hope but few lines of responsibility and hardly any milestones. Surely we can do better than this?